It doesn’t matter how much you search on Google for some cool social media profile or maybe even blog posts, there are employers who will always want to see how your profile has been presented and whether you have that right balance of both professional and personal. 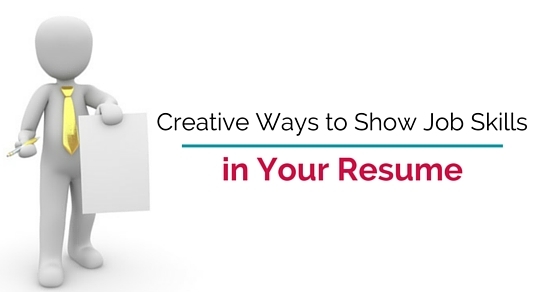 And if you are looking for some ideas and advice on how you could show off your job skills on a resume, this post will definitely help you. The advice has been taken from experts and promises to help you in several ways. So without any more delay, give this post a quick read. Now, this happens to be quite a quick and easy way to help your site become much more visual. Instead of simply writing about the clients that you have worked with in the past, make sure to use their logos and to add some more visual interest to it. If you happen to be in sales, you may use this to highlight some of the biggest clients that you have sold to. In the case of marketing, always think of the companies that you have organized all the partnerships earlier. If you happen to belong to the field of business or even finance, there are several companies you may consult to. In case you are a speaker, you may use the logos for the conferences you have contributed towards. If at this point you do not have any photos of the work you are doing, it does not mean you cannot find pictures that help you represent the work you are doing. You should always think of the ways that you can add general pictures and even describe all those projects that you have worked on before. If you have worked in HR, you should always speak about the projects you have worked on in order to improve the culture of your team. Take a photo of them looking all happy and cheery in a photo and put it on the resume. That tactic would work any day. There are times when imagery just does not make any sense. And in that way, if you want to make your site more visually engaging, you could try a few creative ideas of typography that always works so well. Try different colours, italics that could enhance your skills and make you look like a more creative person. Always remember that every picture speaks a thousand words and people have stories to tell. All you have to do is come up with ways in which you can tell yours in the right and best way. In case your photos are not quite right, you can always do something similar with the help of some icons. For some of these skills that you would like to describe on the site, you can find an icon that is simple and represents it. You can use an email or maybe some microphone to keep your communication skills on point. In case you are worried about the sales abilities, you could also try the graph that is upward trending. In case you are worried about product development, try looking for some light bulbs or maybe a gear. What should you put in your design resume? There are employers who have always loved to hire people who are competent in nature and are proactive. Therefore you should always list all your achievements most prominently. This could also include some of the awards and even more projects when they are prestigious. You can always try an extra tip which could include the logos of your company of some of the clients that you have already known from before. Communication is one skill that is always valued highly and it could always improve your position as well as improve your chances of doing well inside the industry of design. Make sure both your written and verbal skills are on point, especially when it comes to the presentation. The resume should have the whole spectrum of how well behaved you are as a person and how good your communication skills are. If you know how to find some solutions to problems that often arise, could be slightly invaluable to most of your employers. You can, however, become much more flexible in changing the conditions which could be a part of the skills of this kind. You could reason a bit, explore, be much more creative and most importantly experience everything and ultimately your resume will feature all of them when it comes to solving problems and his skills. When it comes to planning some skills and maintenance of the organization, there are traits which are always highly looked up to in every employee, especially when it comes to a world of designers. The skills will always go hand in hand when it comes to meeting a few deadlines or even punctuality. All of this is very essential if you want to come across as a productive person at work. So make sure to follow this point well! Whether it comes to your computer or even some of the software devices, there are several jobs that need you to have the knowledge about the hardware of the company and how differently most of these components actually work for them. If the position that you are in calls for some knowledge on the software or even some specific advice, some of these technical skills will always be displayed in a very prominent manner in the final resume that you present to your recruiters. Whether it comes to the simplest of interpersonal skills with your co-workers to just working with some of your colleagues in a project, if you want to become a team player you have to make sure you know what it takes to become one. Because only team players can handle most businesses easily and they know how to handle organizations! They will also highlight some of your previous experiences where you might have displayed some attitude which will help you succeed when it comes to the efforts of the team. It is also very important to do some research and use a few analytical skills when it comes to designing the best resume. When your job means gathering some more data, the capacity to finish effective and efficient analysis along with research will always separate the average designers from the best ones. All of these areas should always be highlighted when you are putting down your resume in a section that is stand alone. If the job that you are doing needs some kind of management or even the role of a team leader or maybe even some leadership skills, it is most possible that you sort this out with the help of some employer. This will also help you create an environment that is positive, inspires more confidence and is definitely an important skill set. You have to be sure that you are crystal clear when it comes to how you may have done these roles in recent years. Now integrity is something that all employers will always look for in their staff. We live in an age where people are dishonest, are full of scandals and are completely disloyal to their own people. They don’t understand the importance of hiring good people. But when it comes to a designers resume, problems like this can be solved by simply highlighting all the good work that has been done in the past. All of this needs to be given so that your recruiters may trust you and think of hiring you in the future. Social media can help your resume in so many ways. If you are active, do let people know about it. They will manage all the campaigns, come up with strategies that could improve your presence online. You should always use social media to make your resume look bright and that can always be done by using certain social media networks as references. Tools to make your Job Skills Resume look better? If you are looking for a tool that will last you long and help you make that impression you have always wanted, try flavors.me. This is not just a very popular landing page service but one that gives you several benefits. From giving you the customization options to helping you create a profile that is unique and creative, this service can really help you in several ways. It might display just a single photo but the background that it portrays is spectacular. Just keep in mind that it will always take some more time and a little more creativity to come up with a page that is unique. Accredible will always help you create a good portfolio that is full of skills, projects or even a couple of courses online so that you are able to put them on a resume by showing some confidence. It would be quite useful especially if you have your skills picked in some traditional world that is academic in nature. Even some online course will do in that way. For all the skills that you have mentioned in your profile, you can always add more photographs, videos and documents to back yourself up and create a good resume. These profiles are always very easy to navigate. They have notes attached along with videos, endorsements and coursework. Enthuse.me also happens to be quite an easy platform and service that lets the world see what you are all about. This also gives you a personal platform which you can use to your benefit and showcase all the things that you have done in the past. These profiles also have a few layouts that are single paged and also resemble a very regular or usual blog. If you happen to look for something that could customize your resume, the Enthuse.me might not be the right site as they all have designs that are standardized. There are several people in the past who have excelled in their career because of LinkedIn and we bet you will as well. It is not just the best place to showcase what you are all about but also has over millions of people from everywhere around the world and is the first site you should go to whether it comes to the recruiters or even the headhunters. If you really don’t have a LinkedIn profile so far, please go and make one for yourself. You should always update it and boost your networking skills. This will not just help you but also help you connect with those people and help you get the jobs you want. This brings the post to an end. If you have enjoyed reading it and have some feedback to give us, please comment in the box below. A lot of you may also be having questions in mind. Don’t forget to post them either. We would love to answer all of them for you! On that note, good luck and here’s hoping that you always get what you want in life whether it is a resume or landing the job of your dreams.